The greater part of Paphlagonia is a rugged mountainous country, but it contains fertile valleys and produces a great abundance of hazelnuts and fruit – particularly plums, cherries and pears. The mountains are clothed with dense forests, conspicuous for the quantity of boxwood that they furnish. Hence, its coasts were occupied by Greeks from an early period. Among these, the flourishing city of Sinope, founded from Miletus about 630 BC, stood pre-eminent. Amastris, a few miles east of the Parthenius river, became important under the rule of the Macedonian monarchs; while Amisus, a colony of Sinope situated a short distance east of the Halys river (and therefore not strictly in Paphlagonia as defined by Strabo), grew to become almost a rival of its parent city. 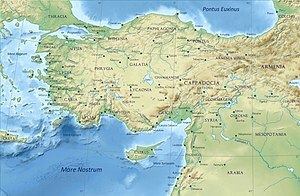 The Paphlagonians were one of the most ancient nations of Anatolia and listed among the allies of the Trojans in the Trojan War (ca. 1200 BC or 1250 BC, where their king Pylaemenes and his son Harpalion perished (Iliad, ii. 851—857). According to Homer and Livy, a group of Paphlagonians, called the Enetoi in Greek, were expelled from their homeland during a revolution. With a group of defeated Trojans under the leadership of the Trojan prince Antenor, they emigrated to the northern end of the Adriatic coast and later merged with indigenous Euganei giving the name Venetia to the area they settled. In the time of the Hittites, Paphlagonia was inhabited by the Kashka people, whose exact ethnic relation to the Paphlagonians is uncertain. It seems perhaps that they were related to the people of the adjoining country, Cappadocia,[clarification needed] who were speakers of one of the Anatolian branch of the Indo-European languages. Their language would appear, from Strabo's testimony, to have been distinctive. Pompey united the coastal districts of Paphlagonia, along with the greater part of Pontus, with the Roman province of Bithynia, but left the interior of the country under the native princes, until the dynasty became extinct and the whole country was incorporated into the Roman Empire. The name was still retained by geographers, though its boundaries are not distinctly defined by the geographer Claudius Ptolemy. Paphlagonia reappeared as a separate province in the 5th century AD (Hierocles, Synecdemus c. 33). In the 7th century it became part of the theme of Opsikion, and later of the Bucellarian Theme, before being split off c. 820 to form a separate province once again. Diogenes of Sinope (4th century BC) Greek philosopher, one of the founders of Cynic philosophy. Wikimedia Commons has media related to Paphlagonia. This article incorporates text from a publication now in the public domain: Chisholm, Hugh, ed. (1911). "Paphlagonia" . Encyclopædia Britannica. 20 (11th ed.). Cambridge University Press. This page was last edited on 27 January 2019, at 06:56 (UTC).